Phase one of our homegrown fertility campaign is the garden/kitchen/chicken compost pile. But that isn't nearly enough to make it through the year. 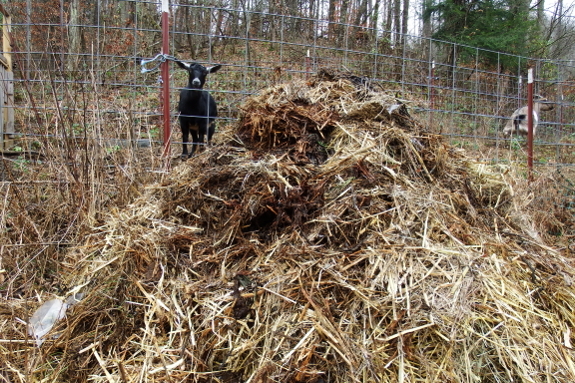 Enter phase two: the goat compost pile. The photo above shows the problem with goat manure. Our dainty eaters drop nearly as much hay onto the floor as they eat, and that spoiled hay is full of seeds. If those seeds sprout on the compost pile, it's not a bit deal. But nobody wants a lawn in their garden. Now, this isn't really as big a deal as I assumed it was at this time last year. After putting uncomposted goat manure on the garden all summer, I realized that it really wasn't any weedier than the composted horse manure we'd been using to date. But I've still decided to earmark the goat manure for large-seeded crops like squash and corn that can easily be protected from weeds using newspaper and straw kill mulches between plants. And, in the meantime, I'm building my goat compost mountain to see how many of those weed seeds I can bake into submission before they ever reach the garden. To that end, I cleaned out the goat barn and also used two older piles to make the pile shown above. 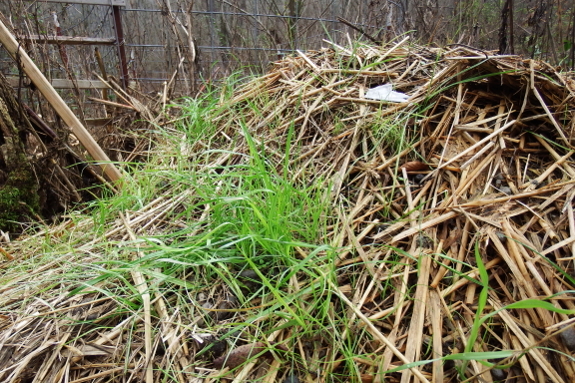 (It looks bigger than it is since the land slopes toward the camera and the pile is supported on the back by a fence.) In case you're curious, that's about three months' worth of manure from two goats. 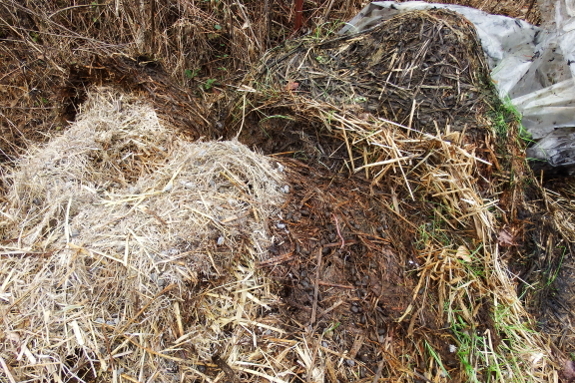 While turning the older compost to incorporate it with the new, I discovered quite a few dry patches like the one shown to the left in the photo above. I'd assumed I needed to cover up the piles after about an inch of rain fell on them to prevent leaching of nutrients, but it seems like I should have allowed for at least twice that much rainfall pre-covering. Now that the manure is in an even bigger pile, I probably should leave it out for a solid month then take a look inside and see how well it's hydrating before pulling out the tarps. In case anyone's curious, this pile, unlike the other, doesn't get human pee. I figure the C:N ratio of urine-soaked bedding with lots of goat berries is close to perfect for compost critters. If you want to read far more about various types of manures and other compostables, I recommend my Ultimate Guide to Soil. Enjoy!